I’ve been paging through some mail order catalogs the last few weeks looking at all the interesting Christmas gift ideas on their pages. 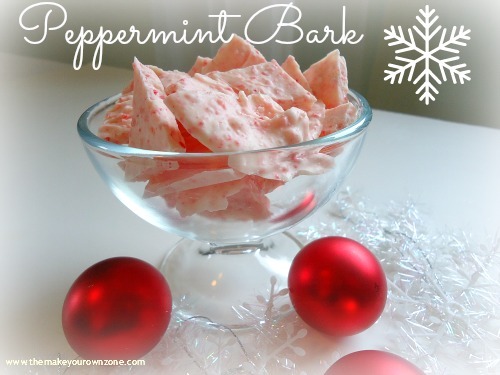 One item that I’ve seen in a couple different catalogs is peppermint bark – and it always looks so good !! The good news is you don’t have to pay the high prices in the catalogs. 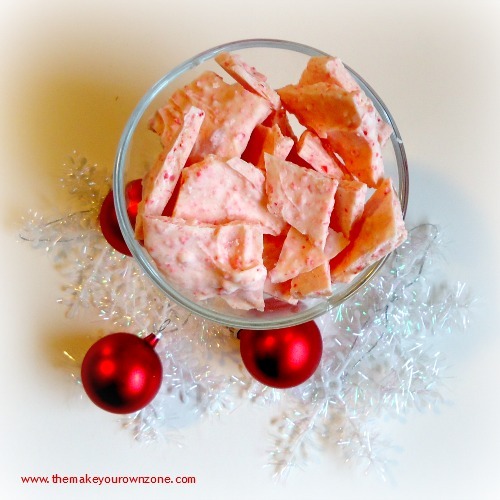 It’s really simple to make your own homemade peppermint bark, and it tastes great too! I made a few changes to a recipe I found in a library book and came up with this easy version that goes together super quick. It’s a great last minute homemade food gift you can make that looks cute in little bags to give as gifts, or it makes a perfect tasty treat to bring for sharing at holiday gatherings. 1. Line an 11×17 baking pan with parchment paper. 2. Unwrap all your candy canes. 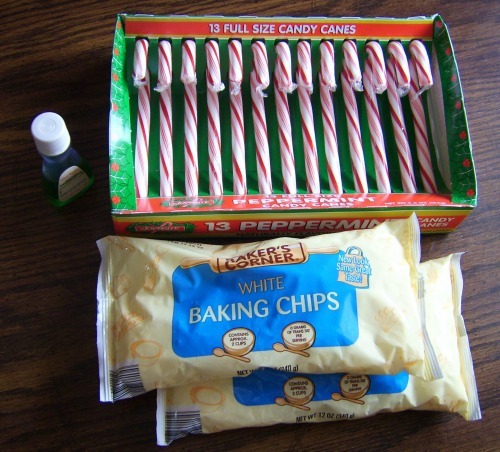 Break each candy cane into a few smaller pieces. 3. 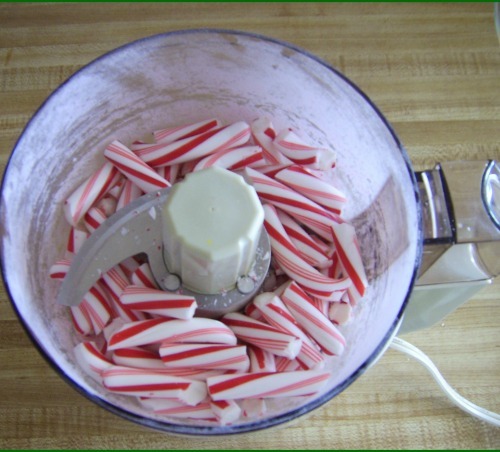 Place all the candy cane pieces into a food processor and pulse a few times to chop them into smaller bite-sized pieces. If you don’t have a food processor you can use something like a rolling pin or meat tenderizer mallet to smash them into bite-sized pieces. 4. Pour the two bags of white baking chips into a large microwave safe bowl. A glass bowl works well. Heat in the microwave for 1 minute, stir, then heat for 1 minute more. The chips should now be melty enough to stir into a smooth consistency. 5. 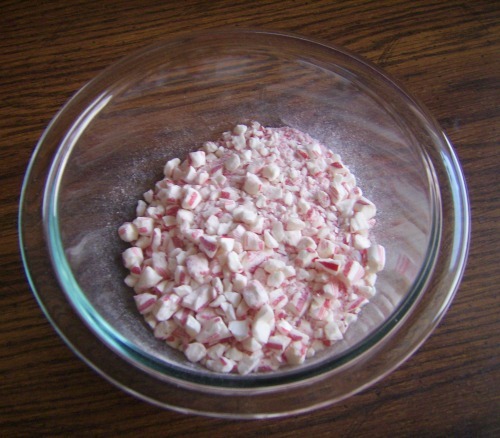 Add the 1/2 teaspoon of peppermint extract and the candy cane pieces to the melted white chocolate. Stir well to combine. 6. Pour the mixture onto the parchment paper lined pan and spread evenly. 7. You can let the mixture harden up at room temperature, or you can pop it in the refrigerator to hurry things along. 8. Once the mixture is hardened, lift it off the parchment paper and crack it into smaller pieces. When my kids were small it seemed like we always ended up with more candy canes around the house than we knew what to do with. A recipe like this is a great way to put those extra candy canes to good use. I have a question. What are white baking chips? Are they white chocolate chips? Or is it something else? Elizabeth – The store brand of white chips that I often buy are actually called “vanilla flavored” which is why I didn’t want to call them “white chocolate chips” in the recipe. The white chips are sold in the same type of bag and in the same area as the chocolate chips, but they are not usually labeled as white chocolate. However, there are some bags of chips out there (such as the Ghiradelli brand) that are in fact labeled as white chocolate and I think you could use them in the recipe and still have a tasty final product. No, you didn’t confuse the issue. Thanks so much! I want to try my hand at this, but wanted to be clear so that I didn’t mess it up. I love this site, by the way! Thanks again, and please, keep up the great work here!